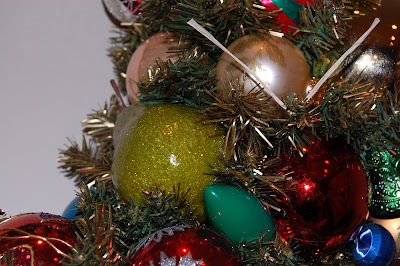 So, what did I learn from this whole crazy thing during the holidays? I can be productive and enjoy creating art even though things are busy with my family. Let me say it in another way. I have a passion for making quilts-being an artist- creating with my hands and there was time for me- and my family. A few yucky dinners every once in awhile but no one was really inconvenienced by me doing something that I really enjoy. And as a mom, I even did a better job of delegating. I had plenty of time to do everything they were involved with and enjoy it, too. And that’s a nice place to be at , at the end of the year. 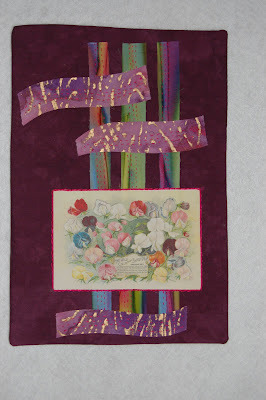 One of my goals for 2009 was to start a blog and begin journaling this art quilt adventure. I am enjoying it and thank you for visiting me. 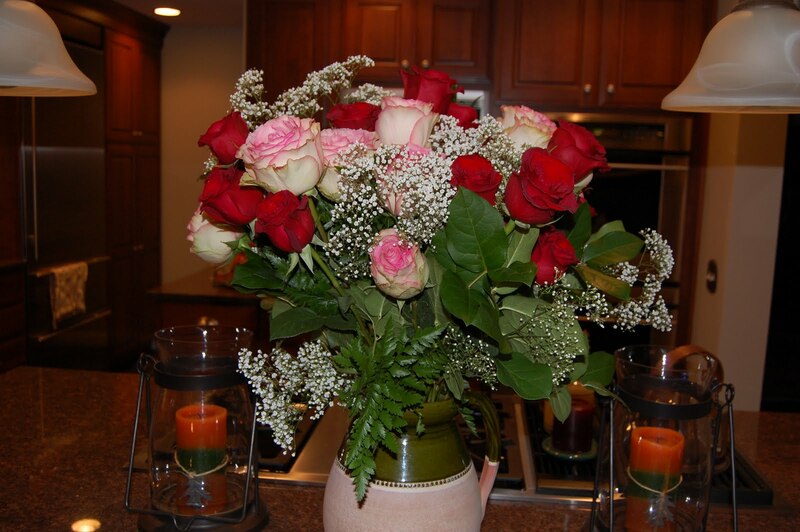 I appreciate your comments from near and far. I am enjoying your works as well. Thank you for stopping by! I won’t have access to the internet tomorrow-just my I-phone which I can’t figure how to blog on. So Happy New Year. 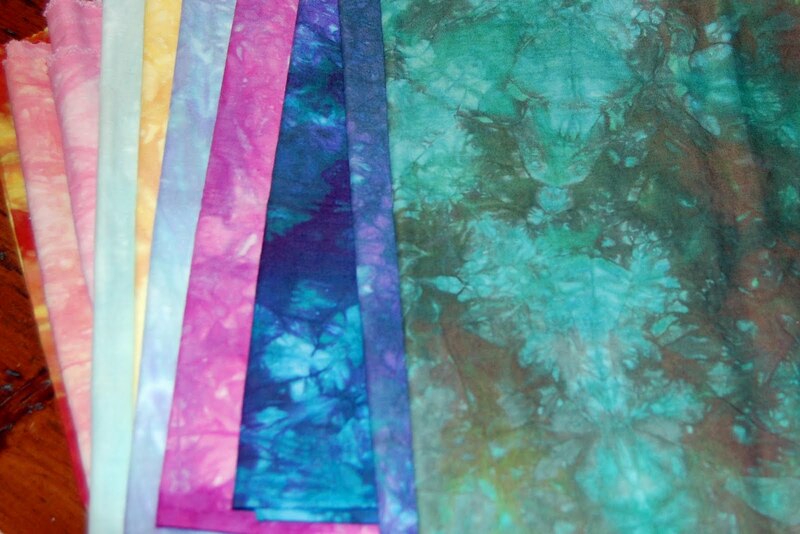 I have lots of fun things planned for January: jeans quilt, snow dyeing…I am never bored . (No I didn’t cave in to the puppy desire….) Having fun playing with them though! This entry was posted in Quilts 2009, small works on December 31, 2009 by Colleen Kole. I think I have known this for a long time but this season has really made me notice this. I am much happier if I can do some form of creating -sewing, knitting or even journaling – on a daily basis. So little snips of time over the past week have led to this. A tiny little work. But it has led me to be more grounded and less stressed to keep making art even if only for short periods of time. It is made from my hand dyed fabrics from last summer. And I enjoy it much more as a end of summer garden vision I had in my head. Yes I did hang it on my tree. Doesn’t everyone hang a quilt on their tree? Just for the photo. So another finish and it needs a name-maybe End of Summer #2. It’s 13×15 and machine quilted. Find a little time to stitch and enjoy the peace, hope and joy this Christmas. 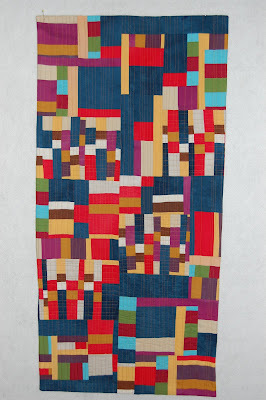 This entry was posted in Quilts 2009 on December 23, 2009 by Colleen Kole. Well, because of the blizzard and three cancelled school days, everything is happening in four days instead of two weeks. I repeat everything- concert, 5th grade play, teachers luncheon and class party. Amazing how it can all be compacted into four short school days. Even more amazing that I signed up to help on all four events. Please remind me next year to take blizzards into account when I sign up for school volunteering in September .My kids are done this week Thurs and my girl comes home from college on Thurs too. I am ready to take a break with no schedules and no sports other than outside fun stuff. I FINISHED #7! I am so excited to think I can actually make this crazy challenge goal. It will be so odd not to have this huge pile of UFOs to start the new year with. 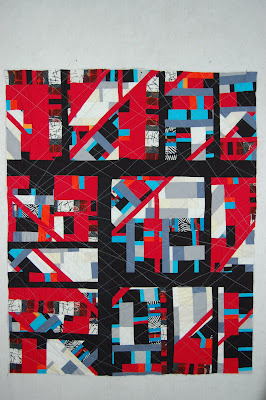 So here it is…(not many are blogging so I know you need pictures…) I do like the next two quilts you will see. 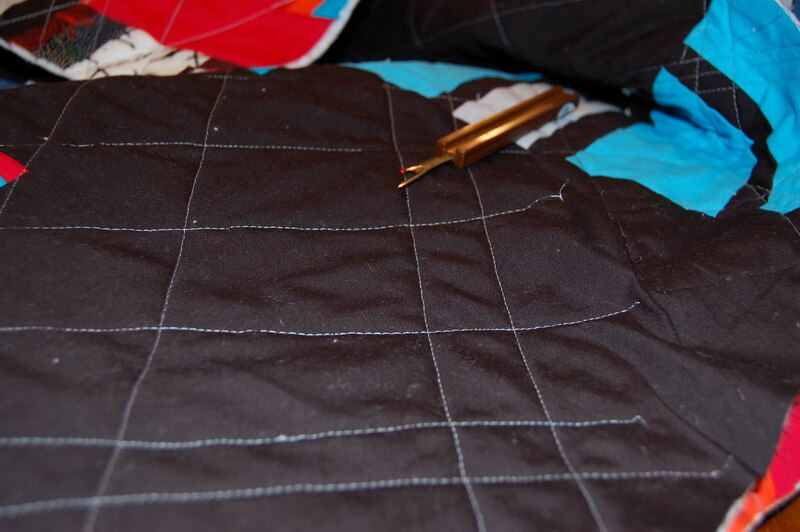 I just did random kind of straight line( improvisational at a very fast speed) quilting. 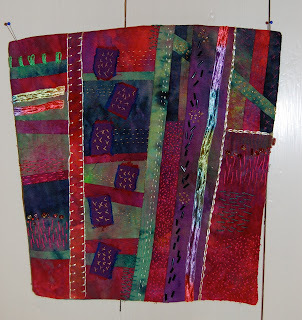 It is made from packet of hand-dyed fabrics from simply robin and a few of my own. I can even say this is one I like. 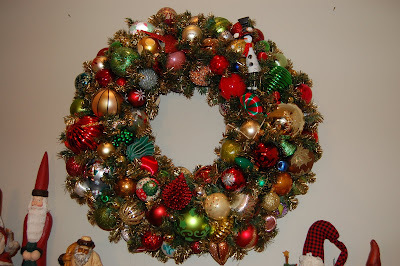 You really needed to see the wreath today. I even took my quilt down above my breakfast nook to hang it up. It needed a place of honor. 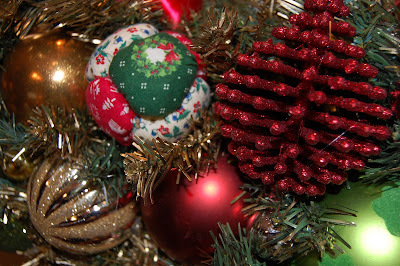 Look at all these ornaments and I know you will remember them from your Christmas’ of long ago-ok when you were a kid. And your calico ornaments. What more could I ask for? I love it and I love my kids. And it makes me smile every time I come into the room because it is just over the top! 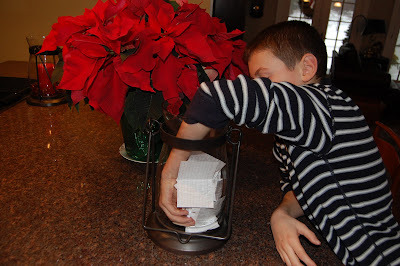 Well, I am over the top as well with a list so blogging must be last on the list the next few days. I have really enjoying catching up with friends I have met over the years at workshops. I will let you know when I finish # 8 . Otherwise, enjoy time this season with your family and friends. Sit by the fire and stitch quietly and remember why you love to sew. 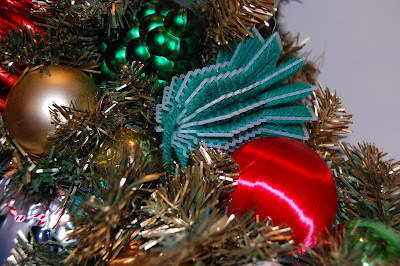 Merry Christmas and happy sewing, my friends! 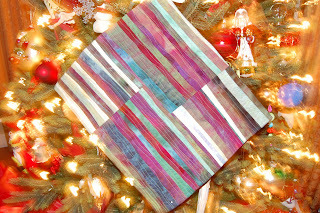 This entry was posted in Connections series, Quilts 2009 on December 16, 2009 by Colleen Kole. It’s in small letters because as much as I would like to keep it a secret, I have to tell you the truth. I hated what I showed you yesterday. Hate is a strong word-disliked. And it bothered me so much I had to go work through it again(ok maybe the series thing is sinking in) or try something different. I can visualize what I want the design to be but can’t execute it yet. Don’t get me wrong- there is improvement- the sewing construction and the speed at which I work is improving. But, the not being able to do what I want is bigger-my frustration- than not wanting to show you yucky stuff. I’d show you if you were here having coffee with what doesn’t work -so i might as well confess here too. It’s all part of the process, I know. I started something new. 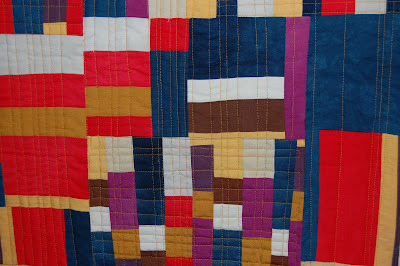 I pieced like you would a crazy quilt. With no plan in mind -each piece directing the next. Smaller. I feel like hand stitching today. I like it but think it looks too much like many other people’s creations….ugh…..but I”ll keep working through it. 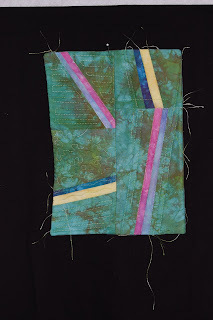 This entry was posted in Directions series, Quilts 2009 on December 10, 2009 by Colleen Kole. 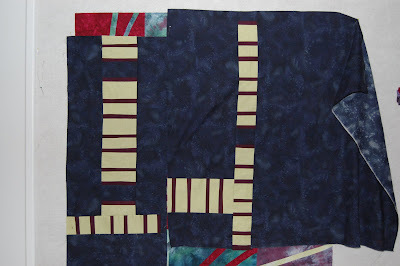 Wahoo- I am done with my quilt and it’s Wednesday – the day of my giveaway drawing. Thanks for all of you who have entered and left comments. I am having fun looking at other new sources of inspiration and you are very talented people! We have a snow day today. No blizzard yet but the calm is kind of eerie right now. The winds are supposedly coming. 1.Sharon-Pieces of Vermont. I have knit socks out of this yarn and they are warm. 2. Robin W– Lorna’s Laces. Very pretty color! 3. Gail Myrhorodsky-ArtGirlz stuff. You will like the beads and silk! Congrats and enjoy the new stuff in honor of a sense of community. Nice to have you stop by. If you e-mail me(colleenkole at gmail.com) your addresses, I’ll get your packages in the mail after the blizzard is done. Hopefully Friday. And I finally finished # 6. Another really big wahoo! If I critique it, it falls flat on composition. I wanted to insert lines into shapes rather than working with strip sets. However, if you go by the definition of line being less than an inch, my lines are too big and look choppy. The main purpose though was to use my Carol Soderlund hand-dyed fabrics. These pieces were my end of the summer garden’s colors in September. I do see this as one of the series I will work on the next year called Directions but will work with smaller lines and smaller compositons to allow me to experiment with it. Maybe….but I definitely have two different series going on without even trying. The burgundy is the only fabric which is commercial and it sticks out too much. I do like the texture of the back though. Must go . Cookie baking has been requested by my kids who have another snow day. Happy Sewing, my friends. This entry was posted in Directions series, Quilts 2009 on December 9, 2009 by Colleen Kole. 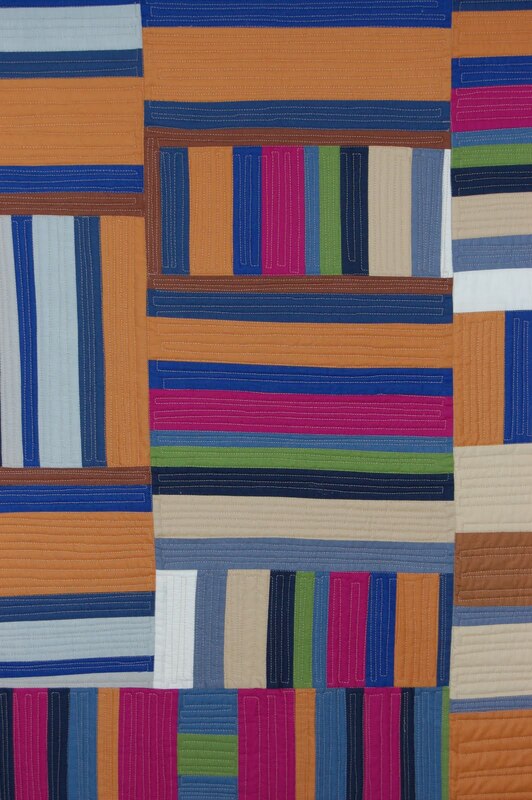 Last February, our quilt guild had the the privilege of hosting Carol Soderlund. She presented a wonderful lecture and then stayed for two days of classes. I attended both days of classes with the first being her Pot-of Gold class. She taught us how to dye layers of cloth stacked three high in a plastic bag and upright container. She was previously a teacher and still had the gift of making everyone feel very comfortable with her. She is a teacher I would highly recommend taking a workshop from. 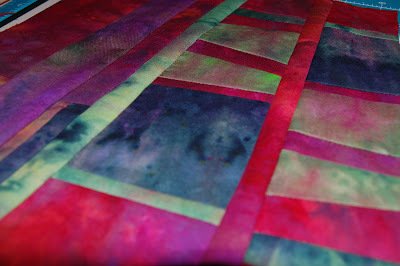 In the quilt I am working on now, I showcased the fabrics we made. 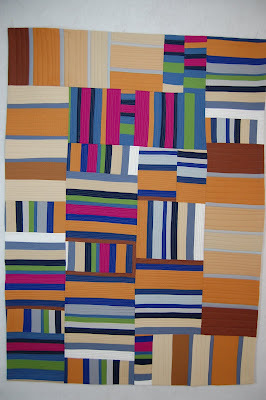 I had made a prototype months ago and finally put it together as a stitch sampler in order to decide how to quilt it. It is one of my UFOS, too. The sampler fabrics are much lighter than the quilt I am working on now. These were the last layer in the “pot” so ended up the lightest. She uses Testfabrics 400 M. I fell in love with this fabric this summer and started ordering it in large quantities. The company is very easy to deal with and ships out quickly. I am going to choose the upper left for my quilting pattern for the next quilt. 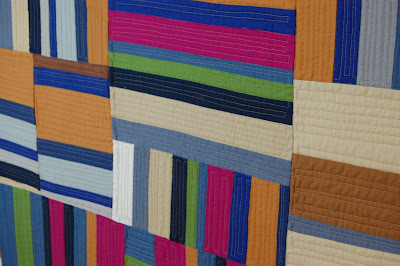 It is the most time-consuming as you are always turning the quilt back and forth but that’s what I like. 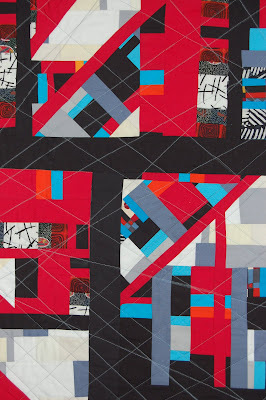 I am feeling like I might have time for two more quilts realistically before the holidays. Must go put the Thanksgiving grocery list together. Happy sewing, my friends. 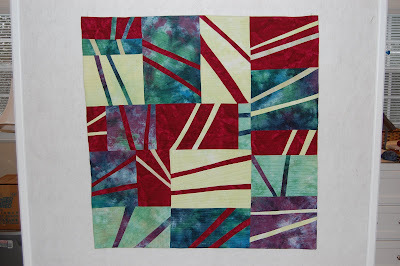 This entry was posted in Directions series, Quilts 2009 on November 22, 2009 by Colleen Kole. I know, I know that almost doesn’t count but this has been crazy week and I want to show you almost. This blogging thing is a bit crazy and I have to admit to you that I missed it this week when I couldn’t keep up with it. I felt like I was letting you down. Or I wasn’t pulling my end of the deal . What is really strange is that I am completing things, I am not sure I even like. Just to have something to show you. Which makes me feel a bit vulnerable and not necessarily proud of what I am producing. But what I am ” getting out of ” this whole thing is a great bit of humility, a great sense of respect for those who do this blogging thing well and much improved construction technique for sewing just because I am sewing more. I have finished #4 except the binding so I know it doesn’t count just yet. It looks like a spider web and I am happy to say Betsy -my new machine-did her part. After a software update and two new parts for a machine less than six months old, she still needs to win me over though. I am skeptical. The binding will be done tonight while I watch tv with the kids. 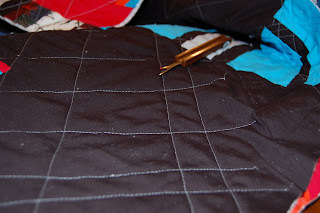 I did some random crazy quilting over a very chaotic quilting. # 5 I am not sure it is worth saving. It was in the middle of the whole sewing machine debacle and I am sick of wavy. So am in a quandry of whether or not to finish. I did spend 2 hours trying to pick out bad stitching. Yuck. 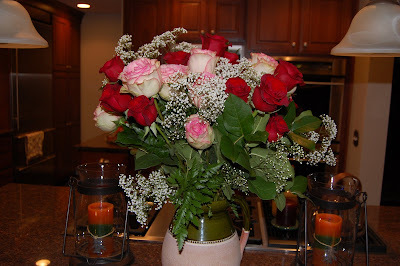 My husband brought home thirty roses yesterday to celebrate our first date thirty years ago. What a nice and romantic guy I have. I am very grateful for him! Now, on to sewing. Happy sewing, my friends. This entry was posted in Connections series, family, Quilts 2009 on November 20, 2009 by Colleen Kole. I can’t believe this one is done. I made it late last February just as a means of using up strip sets and playing around with another neutral color-the tans and khakis. The process of finishing it with all the machine issues just about made me give up on it. 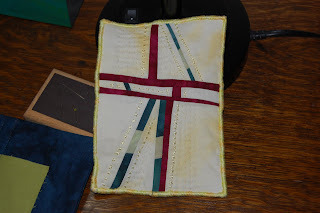 But I left in the areas of stitching that were less than average and a bit wavy. I had fought with it in areas that left it even more wavy when finished. 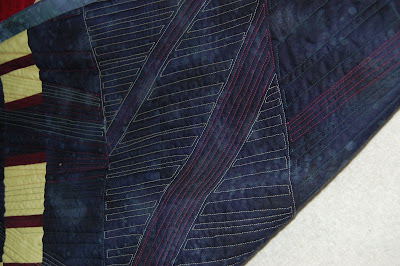 Or it ended up that way because I densely quilted it ( six spools of thread later ) or strip sets just stretch. But it the end , it is done. And done is all that matters today. Can you tell I’m excited? Happy sewing, my friends! 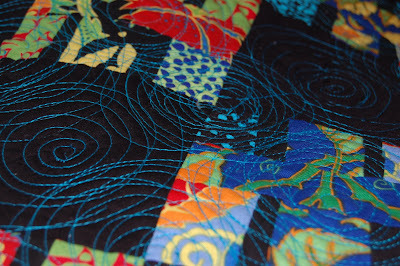 This entry was posted in Connections series, Quilts 2009 on November 17, 2009 by Colleen Kole. I did persevere this weekend and did what I could with my limp-along machine. I feel a bit of desperation sinking in as I did something I have never done before-I put half of a binding on an unfinished quilt. It’s just a flat binding and that side of the quilt was done, so why not? I guess half of my quilting rules are just that. Silly rules. It felt good to move ahead even if it was just a weak attempt at ahead. Machine update: Clare will come home today. Betty will be taken back to the dealer and war negotiations undertaken. Not really mad , just sad and need to move on. I did finish this small work. I am in a fiber arts group and we have been working with different fun stuff-Shiva paintsticks, TAP paper, Lutrador, fabric paint, setacolors when we meet once a month. This little guy has some Shiva paintstick work on it as well as the base made of hand-dyed fabric. The thread is a really heavy silk which I have fallen in love with. It was relaxing to make the needle do what I wanted-in my hands instead of relying on a machine. I also started to piece a back for one of my UFOS. Yes, you say-who would have time for that when you have 6 more? Oh, just the patient one waiting for her machine to be fixed. The back is on top of my quilt top. Crazy yes I am. Or just spinning out of control…. Off to volunteer at Operation Christmas child. Hope you have your boxes packed. Happy Sewing, my friends. This entry was posted in Quilts 2009 on November 16, 2009 by Colleen Kole. I always get distracted when I visit blogs. There is so much fun information out there and sometimes it’s just hard to choose -whether to read or work. But I have found that I enjoying reading at night when my eyes are too tired to sew and my chores are done. Then I don’t feel guilty and can enjoy the information and just catch up-just be inspired. I have felt guilty sewing lately. I love serving with my hands but haven’t truly helped -sure regular mom things at school and at home-but not the kind of volunteering where you know something is absolutely needed-not just wanted. Ok I am rambling but I think you know what I mean. So…since it is the month to be grateful , I decided I would jump in to two donations. One I read about last night and since it directly benefits homeless kids in my city, I can’t say no. I read about it on a blog called http:/artsycraftybabe.typepad.com. They will refer you to Project Hope. (I wish I could have made sock monkey). 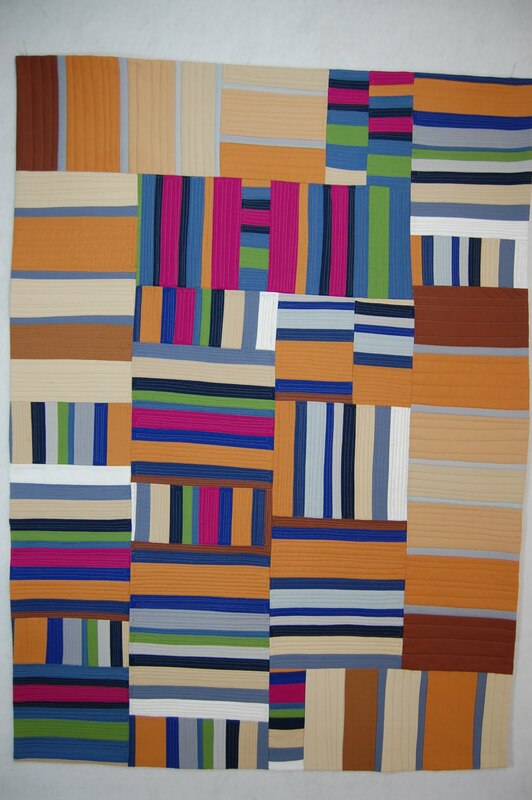 I am going to do a very basic quilt for a little boy. At the same time I will whip up a doll quilt for our WMQG ‘s annual Christmas event-provide a doll and blanket for a needy child. I just feel the need to help someone else! Join in with me if you want. You can do it. I also joined in on the following: finishing my UFOs. I have eight unfinished quilt tops. I said it to you and will keep you posted on my progress. But I neglected to add these two donations so technically ten. 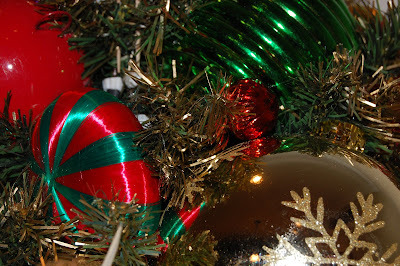 Another link for you to join in with me if you’d like:Tallgrass Prairie Studio: Joy In The New Year. I have committed to finishing them in hopes of starting out the year fresh and uncluttered with tops. Again, join in if you like and let me know too. I’ll check up on you. Ok, I have finished a wee little thing- 5×9. I love the hand-dyed butter yellow. It has traveled in my purse and was worked on during my waiting times. I like the edge-it added lots of texture to this little piece. Happy Sewing my friends. 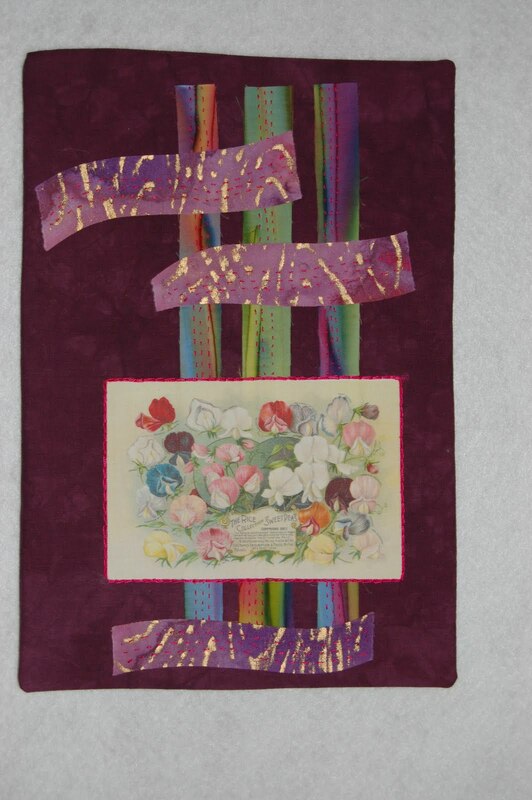 This entry was posted in Quilts 2009 on November 3, 2009 by Colleen Kole.